The Haliburton Forest Paddle Shop is an extension of the operation of Haliburton Forest & Wild Life Reserve Limited (short Haliburton Forest), Central Ontario’s largest privately owned forest. Haliburton Forest is well known for its unique tourist pursuits such as Canada’s only Wolf Centre, the world’s longest Canopy Tour or the world’s only freshwater submarine. But Haliburton Forest is also an active, sustainably managed forest. In 1997 we were awarded Canada’s first Forest Stewardship Council® (FSC) certification, and we have maintained a 100% FSC designation ever since. In a nutshell, Haliburton Forest’s operation, covering over 80,000 acres, including 60 lakes and numerous streams, forms the backdrop for one of Canada’s most prominent destinations for outdoor enthusiasts. At the same time its woods provide a sustainable supply of valuable timber for its own sawmill, which produces high quality hardwood lumber year round. 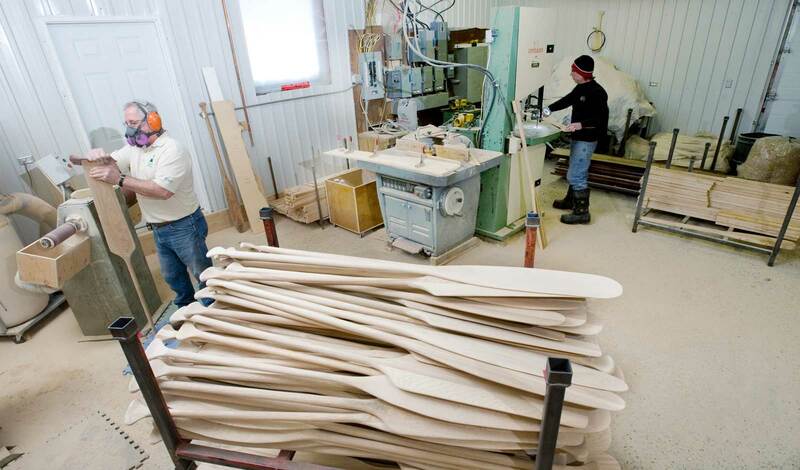 This combination of excellence in outdoor recreation, including canoeing, and the production of high quality wood products naturally lead us into the creation of paddles. And our paddles are not only of exceptional quality, but also as unique as every wilderness experience. We know “paddling” from being involved with it on a daily basis, and we know our forests from working them for generations. The results are paddles, which are tried and proven every day (of course we use only Haliburton Forest paddles in our day to day work). This is reflected in the paddles we produce from the wood of the forests we care for. How much closer can a paddle get to the soul of the outdoors? And if you want to check this out yourself, Haliburton Forest is a canoeist’s delight and visitors have ample opportunity here to wet canoe and paddle, and to experience a very unique wilderness. This is your invitation to visit the home of the unique Haliburton Forest paddles !